They say that in the process of building the aircraft, it actually gets put together and taken apart about 3 times. Well - this will be the first… Today I got the horizontal stabilizer skeleton taken apart for deburring the spars & all of the holes that have been drilled to size. Not much to show there - its all just a pile of separate parts again now.. I also put together the cradles for the HS. There are as many different ways to setup these cradles as there are builders. 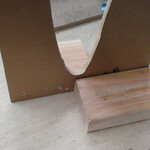 I opted to simply add 2x4 blocks on each side of each cradle to provide support. This provides some flexibility in the exact positioning of the blocks. I still need to put weatherstripping back into the cradles to protect the skins from the wood, but that doesn’t take too much time. 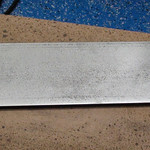 I had also picked up a couple pieces of 1/4” steel plate from Lowes Aircraft Supply to use as a backriveting plate. 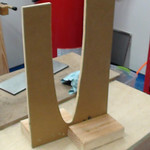 I started preparing the face of one of them to a nice smooth finish with the new DA air sander that I picked up. After a bit of smoothing out with 80 grit, there is a huge difference in the smoothness of the surface. I’ll be finishing up the surface further - aiming for a nice shiny surface when its done.